It’s a normal human trait to procrastinate. Why do today what can be done tomorrow, the more unpleasant the better? Take out the garbage? Clean the litter box? Tell the kids you love them? There’s always tomorrow, and if not tomorrow, then the day after. This is the same quality that makes people engage in the intellectually-dishonest practice of picking out black jelly-beans from a bag of jelly-beans and throw them away, so they can avoid the putrid taste. Me, I’m not like that. I prefer to do the unpleasant stuff now and save the good stuff for later, just to give myself some sense of anticipation and intellectual honesty. After all, while I detest eating black jelly-beans it’s their putrid taste that makes all the rest taste as good as they do. For me, there are a number of black jelly-beans in the Best Picture Project – Gladiator being the most obvious. However, the start of them here will be a little film called Rocky, one that I dreaded watching but after having seen it makes me appreciate just how much better the rest of the films in this little cavalcade are. By now if you don’t know the story of Rocky you’ve been living under a rock – pun intended. Rocky tells the story of a small-time boxer, a real ham-and-egger – the crowds at the first Fight Club were probably bigger than the crowds at some of Rocky’s fights – who manages to get a shot at the heavyweight title because a challenger to the title backs out at the last minute. Rocky is picked because he’s got a cool nickname – The Italian Stallion – and because he’ll surely roll over, collect his money, and move on without any fuss. Except, instead of taking the easy way out, Rocky actually fights for real. Still, despite fighting the good fight, Rocky only comes away with the victory of the losers – the moral victory. Oh, and true love, whatever that’s worth. Before this project began I’d seen Rocky already, was certainly no stranger to Rocky III – especially the parts with Mr. T – and for people of my generation, with all the Regan-era commie-fear, Rocky IV, with all its anti-Soviet sentiment, is something like a cultural touchstone, especially the ridiculous divergent training methods of Rocky and Ivan Drago, told in montage form. See below. Still, even though I’ve seen it before doesn’t mean I adore this film because, as much as others worship it, I’ve just never really connected with it. I mean, it’s indifferently directed and the characters are caricatures of themselves – Rocky could easily have been renamed Earnest, because that’s about all the role requires of Stallone, earnestness – and really, the film is familiar to the point of being trite. When you think about it, Rocky simply lifts the plot of an infinitely better film, Marty, and clumsily fits a boxing story over the top, with mixed-results. Because I’ve never connected with it I’m always surprised by just how loved the movie was. It having been a huge box-office hit doesn’t surprise me – the masses will consume anything, even dreck – see Transformer’s II for proof. That it won Best Picture over such lasting films as All The President’s Men, Network, and Taxi Driver is mind-boggling. In that race it’s only fourth best – at best – because Bound For Glory isn’t exactly chicken-feed either. At the time I suspect it won because the feel-goodedness of the little-guy-makes-good story gave everybody goosebumps. In hindsight, thogh, it looks as shocking an upset as How Green Was My Valley over Citizen Kane. 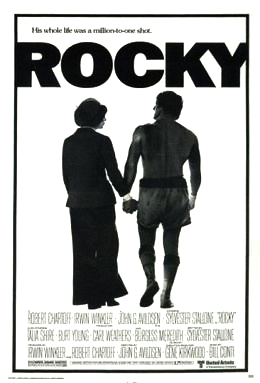 After all, while there are a few iconic moments – the run up the steps of the art museum to the sound of ‘Gonna Fly Now,’ Rocky training by punching beef, or Rocky being unable to open his eye during the fight and saying “Cut me, Mick – are those few moments enough to bestow a film with the Best Picture Oscar? Though I don’t particularly find the film all that interesting, the story behind it, and its legacy, are fascinating. After all, Stallone sold the script largely with the intention of having it made with him the star. 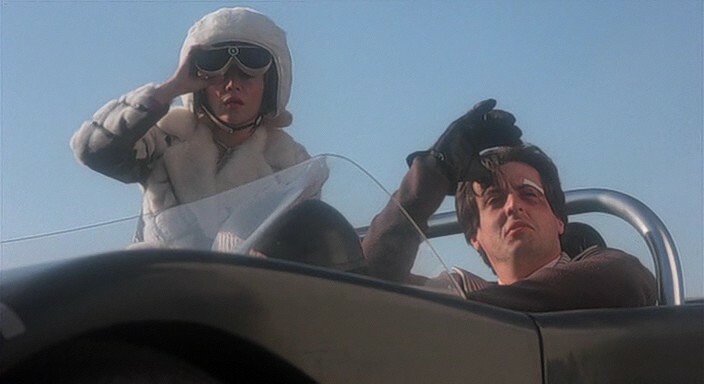 It was rightly recognized as a star-making vehicle and was shopped to other actors but because Stallone had to have the part and was just a nobody at the time – starring in Death Race 2000, notwithstanding – the film might not have ever been made with him, or at all, had the budget not been reduced to just over $1 million dollars, a relatively modest sum for a film even at the time. More interesting is that nobody understood it but the film really did more than break Stallone the actor as much as it broke Stallone the auteur. Except, unlike other auteurs of the era, Stallone wasn’t in the Orson Welles/Francis Coppola/John Ford Mold. Rather, his interest lay in other types of films. As a director he specialized in plumbing the inner depths of Rocky Balboa, helming four of the films in the series and writing all six. As a writer he cast a bit of wider net, pitching in on the scripts for all the Rambo films, as well as such classics as Cobra, Over The Top and Rhinestone. And if we’d never had Over The Top we’d never have had this little gem from the 80’s pre-eminent soundtrack artist, Kenny Loggins. In a sense, it boggles the mind to think of what kind of a career Stallone might have been consigned to had Rocky failed and what the movie-going world would have been deprived of had he faded into obscurity. In some alternate universe one imagines Stallone’s the boss at the same McDonald’s where James Hetfield of Metallica is managing the day-shift, both of whom stand around on their lunch break wondering what might have been. Despite the success of the movie in establishing the upward-trajectory of Stallone, director John G. Avildsen’s never really matched the same orbit. Sure, he won Best Director but instead of signaling a career renaissance, the Oscar seemingly did irreparable damage to it. Before Rocky, Avildsen made such diverse films as Joe and Save the Tiger – Jack Lemmon won the Oscar for Best Actor there – but afterwards he seems to have spent the rest of his career trying to recapture the magic of Rocky and falling victim to the law of diminishing returns. After all, he’s responsible for such Rocky-esque films as The Karate Kid I, II and II; Lean on Me, which is like Rocky runs a school; and the bull-riding film 8 Seconds, each of which has met with less success than the one before. Over the thirty-plus years since his lone win – he was actually nominated a second time for a documentary short subject – he’s had the sparsest amount of box-office success and never achieved the same summit. In hindsight it might have done him better in the long-term if he lost the Oscar to its rightful owner, Sidney Lumet (left) for Network, instead of making him wait for an Honorary Oscar, or even the unnominated Martin Scorcese. At least then he’d have something to strive for. Still, winning an Oscar is seductive and you gotta take one when you can, so compromises have to be made. On the upside, Winkler and Chertoff, the producers, used their clout from this win to get such other diverse films made as Raging Bull, GoodFellas and The Right Stuff. It’s nice to know that some of the guys associated with this film rose above it to produce real art. Still, Rocky and Raging Bull would make an interesting double feature, if someone were so inclined to make it one. The most iconic scene in Rocky shows Rocky running the streets of Philadelphia and bounding triumphantly up the art museum sets, a scene filmed with a Steadicam. I don’t need to link a video to it from Youtube because everybody already knows it. Rocky wasn’t the first film to employ Steadicam – that was 1976 co-Best Picture nominee Bound For Glory. However it was Rocky, and later The Shining, that really helped popularize the use of the technology. It’s the reason why the training montage is so seamless. In addition, while it isn’t quite trivia, I couldn’t help but watch this movie and constantly be reminded of Carl Weathers (Apollo Creed) giving acting lessons and tips of frugality – such as how to get a stew going and the great savings provided by free refills at Burger King – to Tobias on Arrested Development. In a series rife with fantastic guess spots, his is surely one of the best. Click here to see other winners viewed and those remaining.